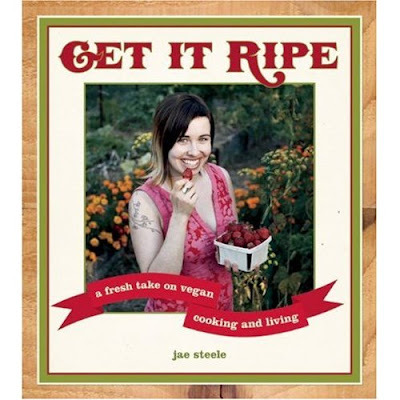 I found out about Jae Steele's "Get it Ripe: A Fresh Take on Vegan Cooking and Living" through the North American Vegetarian Society's quarterly magazine, Vegetarian Voice. The small description about the book really peeked my interest because it mentioned she was a Holistic Health Counselor. It's not often that I find books on Vegan nutrition that are written by someone with this kind of educational background, so I had to get the book! Jae's book is more than a cookbook, it is guide to organic whole foods vegan nutrition. She covers topics like digestion, warming and cooling foods, and a small chapter on cleansing. Her mission is to "encourage a positive food movement that supports DIY cooking with whole foods...food that really nourishes us, that we can build a community around". She also believes that we should strive to get our vitamins and minerals from our food instead of supplements. I'll be posting the recipes to some of these, probably the Kale recipe first since I'm behind on my goal of getting one kale recipe up every week! I would LOVE that cashew gravy recipe please!!! What's in Your Spice Cabinet?